The radiation monitor Radex RD1706 shows gamma-, x-ray- and beta radiation. The radiation monitor is able to measure in radiation areas in a house as well as on human beings. The device is measuring in a range of 0.05 up to 999 µS v/h. Thanks to the comfortable construction of the radiation monitor it especially qualifies for the mobile use and there will not occur any problems storing the measuring instrument. The fast measurement depends on a dose power value. However, a measurement will be done in just 1-26 seconds. The opposite to this will be the long battery life time. This leads automatically to less work. 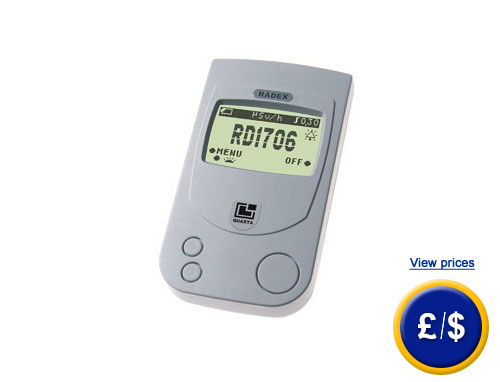 The radiation monitor is also equipped with just 3 buttons and is really easy to use. You will be able to adjust several limit values. When these values will be exceeded the alarm function will give you a signal (sound and vibration). Due to this function you will be informed in case of to much radioactivity and you will be told to leave the particular area in extreme conditions. Thus, you will be protected against contamination. Through the highly legible LC display the measured data will always be legible. The radiation monitor Radex RD1706 will get energy by two batteries of AAA type. The operation of the radiation monitor Radex RD1706 is also possible with only one battery of the type AAA, but this will reduce the battery lifetime significantly. If you have further questions concerning the radiation monitor Radex RD 1706, please take a look at the following technical data or call our hotline: UK customers +44(0) 23 809 870 30 / US customers +1-410-387-7703. Out technicians and engineers will gladly inform you concerning the radiation monitor or any other product in terms of regulation and control or scales and balances by PCE Instruments.